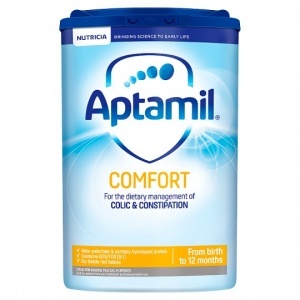 Aptamil Comfort is a nutritionally complete milk that is specially formulated for the dietary management of colic and constipation. Aptamil Comfort is available as a powder. This powdered product requires mixing with previously boiled water before feeding to babies. Aptamil Comfort is thicker than standard formulas so we recommend either a variable-flow teat or a single-hole teat with medium or fast flow. It can be administered from a feeding cup or bottle as appropriate. All Aptamil products carry preparation instructions. Please see packaging for further information. EaZypacks should be stored in a cool, dry place. Do not refrigerate, and use contents within four weeks of opening. Hydrolysed whey protein concentrate (from milk), Vegetable oils (structured vegetable oil, rapeseed oil, coconut oil, single cell oil, sunflower oil), Glucose syrup, Starch (potato, maize), Galacto-oligosaccharides (GOS) (from milk), Lactose (from milk), Fructo-oligosaccharides (FOS), Potassium dihydrogen phosphate, Calcium chloride, Fish oil, Sodium chloride, Vitamin C, L-tyrosine, Choline chloride, Taurine, Inositol, Ferrous sulphate, Zinc sulphate, Uridine 5’-monophosphate sodium salt, Cytidine 5’-monophosphate, Vitamin E, Adenosine 5’-monophosphate, Inosine 5’-monophosphate sodium salt, L-carnitine, Nicotinamide, Guanosine 5’-monophosphate sodium salt, Pantothenic acid, Emulsifier (soy lecithin), Biotin, Folic acid, Copper sulphate, Vitamin A, Riboflavin, Thiamin, Vitamin D3, Vitamin B6, Manganese sulphate, Potassium iodide, Vitamin K1, Sodium selenite. per 100ml prepared feed: Energy : 275kJ, : 66kcal, Fat : 3.1g, of which, saturates : 1.4g, of which, unsaturates: 1.7g, of which, LCPs? : 0.023g, - Arachidonic acid (AA): 0.010g, - Docosahexaenoic acid (DHA): 0.009g, Carbohydrate : 7.7g, of which, sugars : 7.6g, of which, lactose: 7.4g, Fibre : 0.6g, Protein : 1.6g, Whey: 0.3g, Casein: 1.3g, Salt : 0.06g, Vitamins: Vitamin A : 55mg-RE, Vitamin D3: 1.2mg, Vitamin E : 1.3mg, Vitamin K1: 4.4?g, Vitamin C : 8.2mg, Thiamin (B1) : 0.05mg, Riboflavin (B2) : 0.11mg, Niacin (B3): 0.44mg, Pantothenic acid : 0.33mg, Vitamin B6 : 0.03mg, Folic acid : 12mg, Vitamin B12 : 0.18?g, Biotin : 1.3mg, Minerals: , Sodium : 25mg, Potassium : 86mg, Chloride : 53mg, Calcium : 76mg, Phosphorus : 50mg, Magnesium : 5.2mg, Iron : 0.53mg, Zinc : 0.5mg, Copper : 0.04mg, Manganese : 0.008mg, Fluoride : <0.003mg, Selenium : 1.5mg, Iodine : 10.8mg, Others: , L-carnitine: 0.9mg, Choline: 10mg, Inositol: 3.3mg, Taurine: 5.3mg, Nucleotides: 3.2mg, Long Chain Polyunsaturated fatty acids. EaZypack makes bottle feeding easier To open, remove tamper evidence strip on the rim of the pack. There is a handy leveller built into the pack. Store your scoop in the lid so that it is kept safe and secure. Click the lid securely shut to keep your powder fresh. Preparing your baby's feed Because powdered milks are not sterile, failure to follow instructions may make your baby ill.
2. Boil 1 litre of fresh water. Leave kettle to cool for no longer than 30 mins. Measure the required amount of water into a sterilised bottle. Be careful of scalding. Do not use artificially softened or repeatedly boiled water. 3. Using the scoop provided level off the powder with the built in leveller. Do not press/heap the powder. 4. Add the required amount of powder to the water. Adding too many or too few scoops can be harmful. Cap the bottle and shake well for 10 seconds to dissolve the powder. Remove cap and replace with a sterilised teat.